Hi everyone! A severe bout of flu + sinusitis has left me with a rather hoarse voice, so I won’t be able to record a video this month. But by the grace of the Goddess, I’m healed and well enough to present you the TAO of Kelly as an article. Thank you for your understanding! Now, a quick astrological report for August: it’s still going to be gnarly in the cosmos, with several planets retrograde – the two main retrogrades we need to watch out for are Mars (which rules action, energy, and enterprises) and Mercury (which rules travel, communication, and technology). The Mercury retrograde ends on 19 August whilst the Mars retrograde ends on 26 August, but both retrogrades have post-shadow periods that stretch for a few weeks more, so basically the whole of August is a good time to lie low and be discreet about new ventures, travel plans, etc. We’re in the home stretch of the midyear eclipse season of 2018 as well, with the final eclipse on 11 August – a partial solar eclipse starting at 4:02 pm and ending at 7:30 pm, Singapore time (UTC+8). This eclipse falls in Leo, and encourages us to dig deep within ourselves to discover the truth of our identity, confidence, and inner strength. The signs most likely to be affected by this astrological season (from most affected to least) are Scorpio, Leo, Aquarius, and Taurus. To some extent, Aries, Gemini, and Virgo will also be slightly more shaken than most. It’s good to get a free birth chart reading done (Google ‘birth chart calculator’ and you’ll find lots of options) and see which signs your various planets and houses fall in – this gives you a clue as to how you’ll be affected, and how best to deal with the energies that arise. That’s it for the astrology. Let’s get to the reading! If you have new ventures to start this August, make your plans and execute them – but be discreet, check for the best timings possible, and manage your expectations wisely. Delays and setbacks may arise, and/or results may surprise you. But does that stop you from living your best life and putting your best foot forward? HECK NO. I say move forward! Understand this: it is wise to work with Universal energies, but do not allow external factors to control your decisions unnecessarily. Don’t allow eclipse season and/or the retrogrades to get you down! This season, and the reversed Ace of Wands, are FANTASTIC for the following actions: revising, reviewing, repairing, recovering, redoing, rediscovering… put a ‘re’ in front of whatever you were planning to do, and see how you can get that done. You’ll be amazed – retrograde and eclipse energies SUPPORT these actions, and you’ll be SO productive. And here we have Gabriel/Gabrielle, Archangel of the Annunciation. S/he was the Archangel Who appeared to Mary and announced that she was pregnant with Jesus, the Messiah. As Jibreel (the Arabic form of the name), S/he was also the Archangel Who appeared before Mohammad, messenger of Allah, and dictated the Quran. Gabriel/Gabrielle is unique in that S/he possesses both masculine and feminine energies in equal measure. I tend to resonate more with Gabriel as a male Archangel, but many perceive Gabrielle as a very healing feminine presence. As an oracle, I work closely with this Archangel. As you may have guessed by now, Gabriel/Gabrielle rules communication, and He/She is extremely powerful. 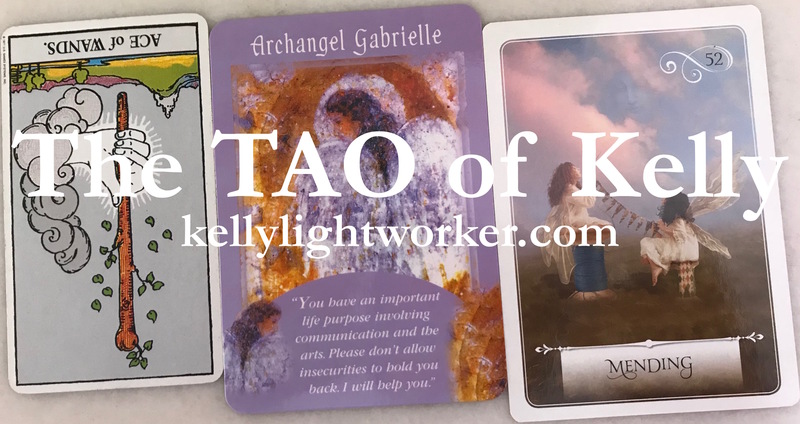 Gabriel/Gabrielle appears in this month’s TAO to remind us that we can call on Him/Her for wisdom, guidance, and assistance in any matter regarding communication. With Mercury retrograde potentially crossing lots of wires for us, it’s great to know that this Archangel has our back! This month will be a month for powerful healing to be facilitated through the acts of forgiveness and reconciliation. Remember what I said about putting ‘re’ before your plans and moving forward from there? Yup. Repair your brokenness, and return to innocence. It could be your health, your relationships, your career… whatever it is, you’ve put aside the pain for long enough. Now is a great time to fix what needs fixing, and to release whatever you’ve outgrown. Because you deserve love, peace, blessing, and happiness. It’s time to de-clutter, darlings.